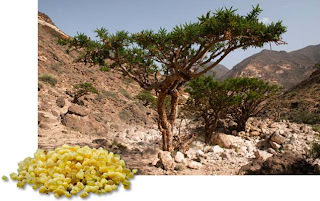 Frankincense, also called olibanum is an aromatic resin obtained from the desert tree Boswellia. It is used in incense and perfumes. There are four main species of Boswellia which produce true frankincense and each type of resin is available in various grades. The grades depend on the time of harvesting, and the resin is hand-sorted for quality. Unfortunately, frankincense, has now become even more rare. In the Journal of Applied Ecology, researchers say that frankincense will continue declining in supply. Boswellia trees have had trouble reproducing in recent years, and ecologists believed that they were weakened when traders tapped them for resin. Working in Ethiopia over a period of 2 years, the researchers monitored 12 copses of B. papyrifera: six that had been tapped and six that had not. A copse is A thicket of small trees or shrubs that is being pruned for resin. They found that the tapped trees were able to reproduce as well as the untapped, ruling out human interference as the major killer. Instead, the biggest threats seemed to be grazing livestock, fires, and the longhorn beetle, which burrows into trees' bark, kills them, and leaves them as ready fuel for forest fires. If these problems aren't remedied soon, the team's models suggest that frankincense production could drop by 50% in the next 15 years: a tough blow to the economies of Ethiopia and Eritrea who export it.